Since Android is in fact an open operating system, this does make it more vulnerable to malware attacks and created more security problems. It was not too long ago that a good amount of applications were removed from the Android market after the discovery of malware embedded in the apps. However being an open security system Android has its benefits as well, such as the ability to run security functionality in the background, such as automatic back ups and system scans. With the Android consumer base growing larger day by day, developers are working towards safer apps that also provide OS security. 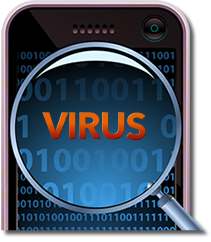 Many of the well known names in PC antivirus development are already beginning to appear in the Android market. AVG is a famous name in the antivirus and security department is now also visible in security for smart phones. This app formerly went by the name of DroidSecurity and has been further developed to provide even better features. With the Mobilation antivirus you can have a scan of everything running on your phone and it even backs up your contact log and bookmarks. Not only this, but the app also permits for a lock capability in the case that you have lost your phone it has been stolen. These features are specific to the free version and the paid account for this app adds to the list an Applocker feature. Through which you can password protect your apps and secure your inbox from SMS spam. Best of all, the paid version is with out any ads on your phone, saving you battery life, however there is the option of purchasing Applocker separately for $3. Wave secure mobile security also offers a wide range of features but requires an annual subscription which will cost $20. With the Wave secure app you can wipe your phone remotely in the case that it is lost or stolen and you can even lock down your phone if it goes missing. Though, the Wave secure app does lack the ability to scan your device for malware or other infections. It does offer a backing up feature through which you can back up a copy of all your phone data and if need be, restore this information and data to another device. Another interesting feature to further reinforce the apps abilities is the Wave secure uninstall protection. This will not let another user uninstall wave secure from the target phone without giving a password first. Once the uninstall protection apps detects that an uninstall has been attempted it will automatically lock down the device. Trend Micro can secure your phone for a reasonable annual subscription of $3.99. This app maybe particularly useful for parents as it provides greater control over Web content and at the same time provides antivirus and anti malware protection. Though unlike many of the device security apps available this app from Trend Micro does not provide remote features such as remote locking or remote locating. The main focus of this app it seems is assisting you in relocating your lost or stolen mobile device. The app offers the NetQin Anti-Lost feature with which you can locate your phone in the case that it’s stolen or lost. With the same feature you can erase the phone’s contents and lockdown the device remotely. Interestingly you can even have your device emit a loud alarm that sounds much like the police siren. This is a free app and would work well for people who are prone to loosing there phone. Beth infatuation with cell phone spy software technology, gizmos Blackberry spy reviews and gadgets goes back a decade. Her pieces are funfair of information for her readers on what’s new and what’s hot.